Get yourself into a five card frenzy on the brilliant Jacks or Better Double Up. This online version of the Las Vegas classic lets you ride any win for a big time gamble. 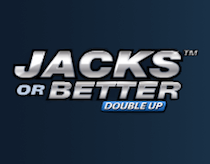 If you like your online versions of classic casino games then you won’t go far wrong with Jacks or Better Double Up. This blazing title gives you some of the very best five card action you’ll find anywhere on the web, complete with a brilliant gamble game that has the potential to help you snowball the smallest prize into an absolute cascade of cash. Use the COIN VALUE to set the size of your coin. The LEVEL button assigns between 1 and 5 coins to each game. MAX BET starts a game at the highest LEVEL with your current COIN SIZE. The DEAL button starts the game. After the first draw you are allowed to hold between 0 and 5 cards using the HOLD buttons situated below the respective cards. The HOLD button selects and deselects the card above. When you are satisfied with your choice of cards you wish to HOLD, press the DEAL button for the second draw. Wins are then evaluated and you can press the GAMBLE button to access the card flip gamble game. In the GAMBLE game use the RED and BLACK buttons to predict the colour of the next card, or use the COLLECT button to take your winnings thus far and end the game.